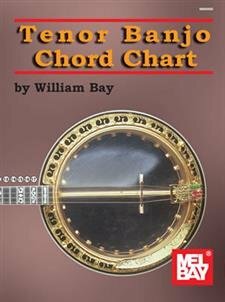 This chart shows essential chords and secondary minor chord relationships in all 12 keys for the tenor banjo in C-G-D-A tuning. The chords shown for each root note are major, seventh, minor, diminished, and augmented, with relative minor I, IV, and V7 chords al fingerboard with all the frets numbered and the corresponding notes shown in standard notation. This chart is also applicable to the tenor mandola, which uses the same tuning. Unfolds to 17.5" by 11.75". Also suitable for mandola.